A digital printing house uses machines called digital presses. These allow us to achieve results very similar to traditional lithographic printing, keeping the cost of printing low on short runs. Digital printing presses usually use laser technology and are mainly used to print short run jobs, such as small quantities of business stationery, business cards, photo books, calendars, leaflets, books and so on. What is lithographic or offset printing? This is the most common and widely used printing technology today. Lithographic (or offset) printing is a 'wet process' using printing plates to transfer liquid ink onto paper. Lithographic printing gives the best possible quality and is most cost effective on medium to long runs due to the initial cost of setting up the printing plates. What can I print in a printing house? A commercial printing house can print all kinds of materials, such as: business card, compliment slip, letterhead, leaflet, flyer, poster, brochure, booklet, pamphlet, book, thesis, dissertation, folder, invitation, stationery and more. 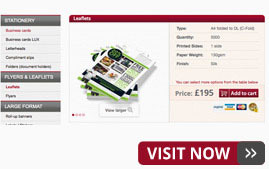 To check prices of the most common products we print, visit our Online Printing Shop. What quantities do you print? We can print any quantity, starting from just one copy. Depending on quantity we choose the most cost effective setup to provide both the best price and quality. Small quantities are printed digitally and medium to long run printing is done lithographically. How do prepare files for printing? Start from dowloading a template of a desired product from our website in one of the common file formats: EPS, INDD (Adobe InDesign), AI (Adobe Illustrator) or PSD (Adobe Photoshop). Printing templates are located on the Products tab next to each prouduct described. Also visit the Printing templates tab of our Online Printing Shop to see the full list of printing templates. Based on the blank template you can prepare your design and save it as PDF file. Then send it to us for a general check. We will let you know if there are any issues with your artwork. You'll find more details on how to prepare files for printing in a commercial printing house on our Prepare for printing tab. Printing job in a hurry? We'll pull out all the stops to get it done for you in 48 hours or less – call us to find out about our Express Service. Copyright © CE Print Ltd 2008-2017.